Miss Tichenor Kitty | Michael Fuhlhage, Ph.D.
Miss Tichenor Kitty indulged me by sitting for a portrait on the Friday afternoon before spring break. The corner of her left eye appears red from a wound from fighting or getting scratched by a branch or thorn. Miss Tichenor Kitty came out a third day in a row this afternoon, which must mean winter is officially over here on the Plains. The life of a feral cat must be quite a challenge, though I imagine those on college campuses must have it better than others. Yesterday she scampered out of the bushes outside Tichenor Hall, and the sound back in the leaves suggested she was fleeing from another animal. My first concern for outdoor creatures in semiurban settings (beyond exposure to the elements) is that they might cross paths with abusive and sadistic humans, perhaps mean kids or those who became mean adults when they got older. But feral cats have to contend with rivals and predators. They are, after all, part of a wild ecosystem. Much as I’d love to take in Miss Tichenor Kitty, feral cats who were never socialized to human contact as kittens don’t stand much of a chance of learning to live inside a house. Household noises like the sound of a bag of food opening tend to register as harsh noises to be avoided, whereas your typical housecat would take the arrival of a new bag of kibble as cause for celebration. Socialization to humans: Strays will approach people, houses, porches or cars. Ferals will not approach and will usually seek hiding places to avoid people. Socialization to other cats: Strays usually live alone and are not part of a group. Ferals may belong to a colony of feral cats. Body language: Strays walk and move like housecats. They walk with their tail up in a “question mark” shape, which indicates curiosity and friendliness. Ferals keep low to the ground and often crawl and crouch. When they sit, they keep low and protect their bodies with their tail. Vocalization: Strays may be vocal, meow, or answer your voice by meowing in response. Ferals do not meow, beg or purr in humans’ presence. Miss Tichenor Kitty made more of a high-pitched mew than a meow when I talked to her, but not quite a meow. Physical appearance: Strays usually look dirty or disheveled. Ferals usually have a clean, well-kept coat and may have scars from fighting. Male ferals tend to have a spiky coat from high testosterone levels if they have not been neutered and may have “stud tail,” which is hair loss, greasiness or bumps at the base of the tail caused by hormones. Ears: Ferals that have been captured, neutered and released back to their home turf will be missing the tip of one ear; this is a marking that capture-neuter-release programs use to show that a cat has already been neutered. Strays usually will have both eartips intact if they were neutered when they were pets. They may have an eartip missing if they were captured, neutered and released. What can you do to help stray or feral cats? Alley Cat Allies has great advice for how you can help these animals. If they’re feral and neutered (signified by their lack of the tip of one ear), leave them alone to live with their colony or at least be kind and friendly to them and do what you can to help them survive in the wild since they most likely can’t become house pets. That means watching to see if they’re a healthy weight, a sign that they’re being helped already. If they’re not, you can leave food and water out for them. If you encounter a scared stray cat, do what you can to help them be adopted into a home (or adopt them yourself). If you encounter a calm stray cat, find them a good home. One kind of feral cat can be prepared for adoption: feral kittens can be socialized for adoption. Miss Tichenor Kitty approached after I talked to her, but no closer than a few feet. She likes people, but she’s still wary of them. 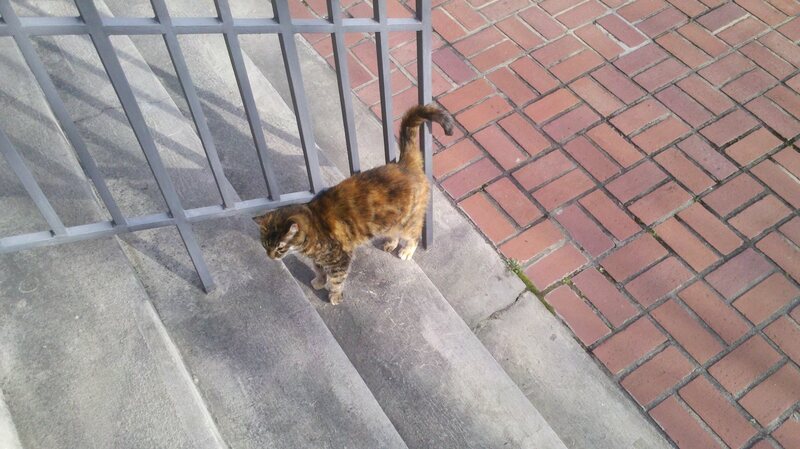 I am greatly relieved by the return of Miss Tichenor Kitty, a young cat I’ve seen from time to time outside Tichenor Hall, the location of my office at Auburn University. It’s been an unusually harsh winter for East Alabama, with several hard freezes and temperatures that sank into the single digits more nights than I’d care to remember. A student told me she usually sees her out on the front steps of Tichenor Hall just before class. Guess I’ve been in the wrong place at the wrong time to see her. Thing is, I’m used to seeing her on the other side of the building and late at night. Why’s that? Well, once it heats up into the 90s in the spring and summer, I usually push my workouts to late at night. Campus is a great place for a run, and Tichenor is a good place to stop on the way back home after running out two miles from my home to the western edge of campus. Miss Tichenor Kitty is one of the late-night characters I’ve encountered, and on more than one occasion I’ve seen bowls of food and water laid out for her. She’s shy and wary, as a feral cat tends to be, and she seems to be a member of one of the colonies of feral cats on campus; you can tell them from their tipped ears that they have been captured, neutered, and returned to the wild. Wariness improves their ability to survive, I guess. The first time I saw her, maybe a year and a half ago, she let me no closer than 12 feet away and maintained a constant bubble of space between us. Guess I’m not a stranger anymore to her; she let me within three feet before she activated the force field. Anyway, it’s great to see her again. Maybe this is a sign that spring is really here. She’s a pretty cool creature to have as a substitute for a groundhog.